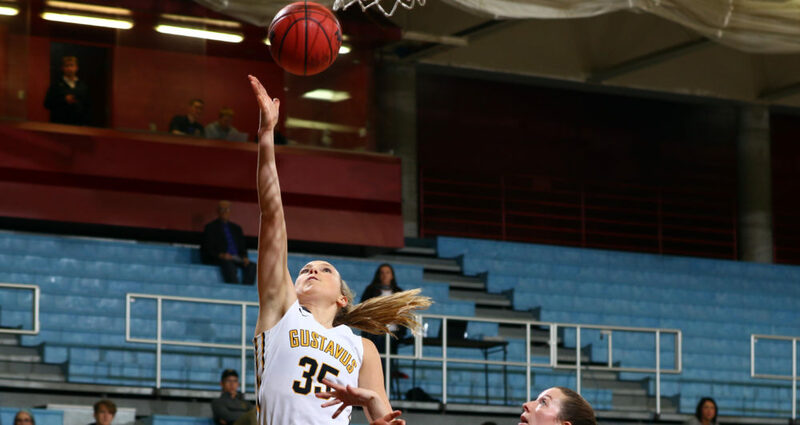 SAINT PETER, Minn. – The Gustavus women’s basketball team cruised to a 75-51 victory over UM-Morris on Friday night in its home opener, improving to 1-1 early in the season. Gustavus limited UM-Morris to 36 percent shooting from the field and won the rebound battle 37-28, which proved to be the difference. Thompson led all scorers with 23 points on 10-of-15 shooting from the floor. She also contributed five rebounds and three steals. Richert posted 17 points on 7-of-11 shooting, including a game-high six rebounds. Eleven different Gusties scored points. After a back-and-forth start to the game, Gustavus erased a 10-9 deficit with a 19-2 run at the end of the first quarter and into the second. The Gusties led 38-22 at halftime and were able to get a majority of their reserve players into the game in the second half. Gustavus returns to action at 3 p.m. Saturday, playing host to Martin Luther.